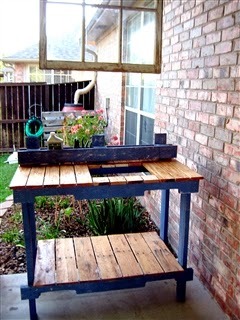 Mia's Garden: Finally Finished - My Re-Purposed Wooden Pallet Potting Bench! 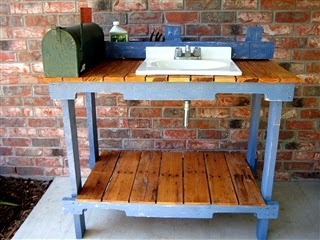 Finally Finished - My Re-Purposed Wooden Pallet Potting Bench! Now THIS is cause to celebrate!! 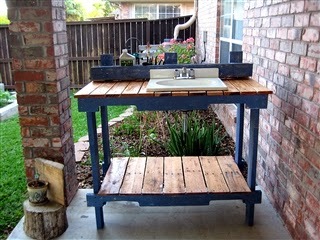 Last Fall, I decided I would like to try to build a potting bench, with a sink for washing garden vegetables. 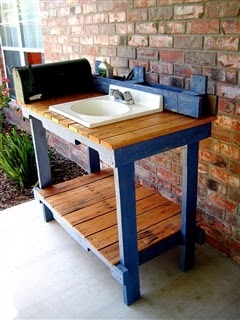 I researched them on Pinterest and decided I could make one with old, discarded wooden pallets. Since I didn't own very many tools and had never built anything like this before - I had NO idea what I was getting into. But today, putting the finishing touches on it, I am SO very proud of all the work I did and how much I learned from the project. If this is the last time I ever use a scary circular saw, it'll be fine with me! I was so glad when I made the last cut and could safely put the saw away in the garage. I'm giving thanks to God that I still have all my toes and fingers! And I now know you need to wear earplugs when cutting with a circular saw! The sink was found at our local Habitat for Humanity Re-Store and couldn't have been a more perfect fit. The back piece (where I will put my garden tools and supplies) was a part of the pallet that I had cut off and used all along as a saw horse to make my other sawing cuts. That piece and I have a history now, so it was fun to put it to use on the bench and gives me a few little cubbies to store tools. The only thing left to do is hook it up to a hose when I want to run the water. That, as well as getting some vegetables growing that need to be washed! Thanks! It was harder than I thought it'd be but I'm so proud of how it turned out. Yes, earplugs and eye protection. Always a must when working with saws and other shop equipment.